After our first flour experiment, comparing our favorite stone ground organic wheat flour with one of the cheapest supermarket flours, we were eager to do some more testing. 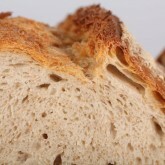 This time we wanted to focus on comparing flour from different windmills and very likely wheat from different farmers. 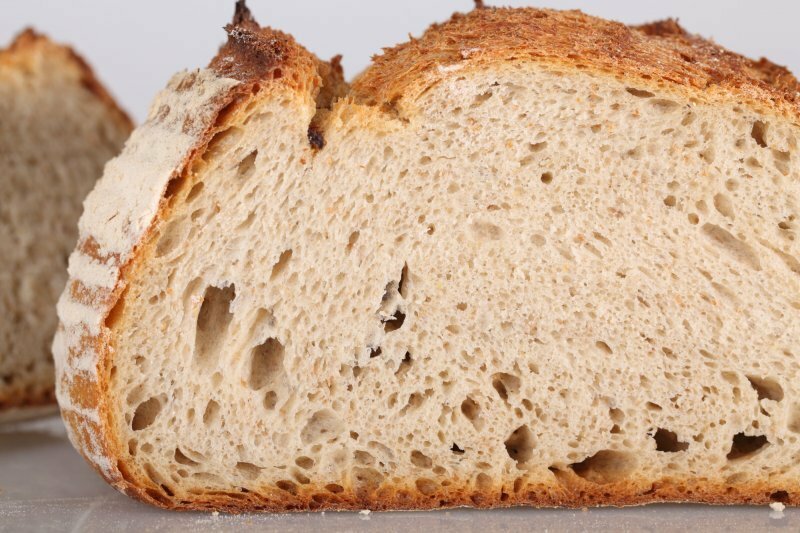 Would using the same type of flour from different mills and sticking to exactly the same recipe, result in loaves basically looking and tasting the same? Or would there be difference enough to establish at least a preference for one or the other? 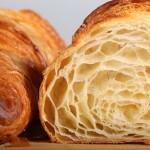 We devoted a whole day (and some pre-baking day preparations of course) to this testing. A baking friend of ours was kind enough to assist during baking day. 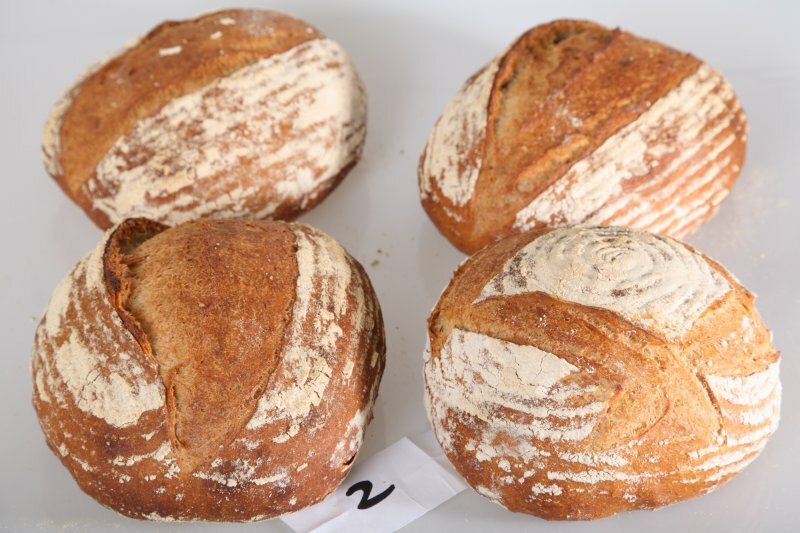 The main challenge after this test was describing how the breads differed in taste. O boy it is hard to name the different nuances in bread smell and taste. It is much easier with wine and coffee where you can get all lyrical hinting at the subtle notes of sun soaked apricots and the intense bittersweet aroma of chocolate or your grandfathers leather chair. But what is the vocabulary for describing different tastes in bread? The flour we bought at each mill was the one sold as regular wheat or bread flour (tarwebloem in Dutch). 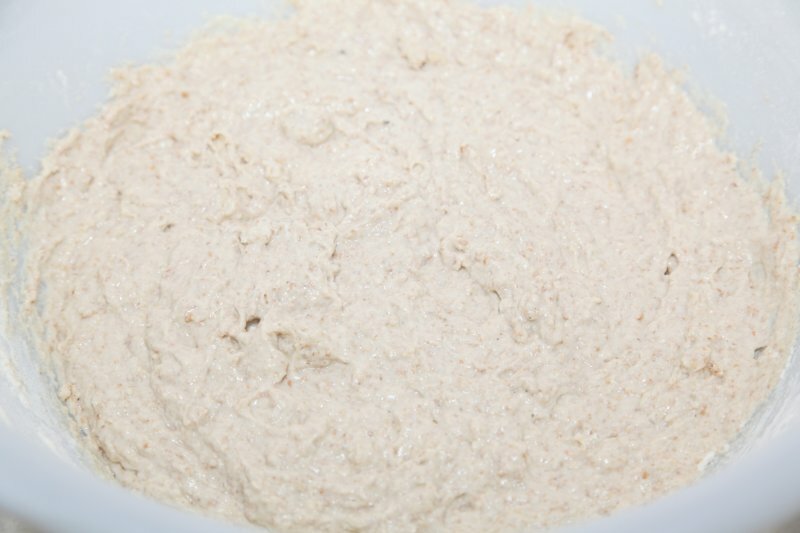 Versions 1,2 and 4 are organic flours, versions 3 and 5 are not. NB: Some mills do all their own milling, others outsource part of the milling to other mills. For your information: The flour milled by De Windotter was bought at windmill De Eersteling in Hoofddorp. 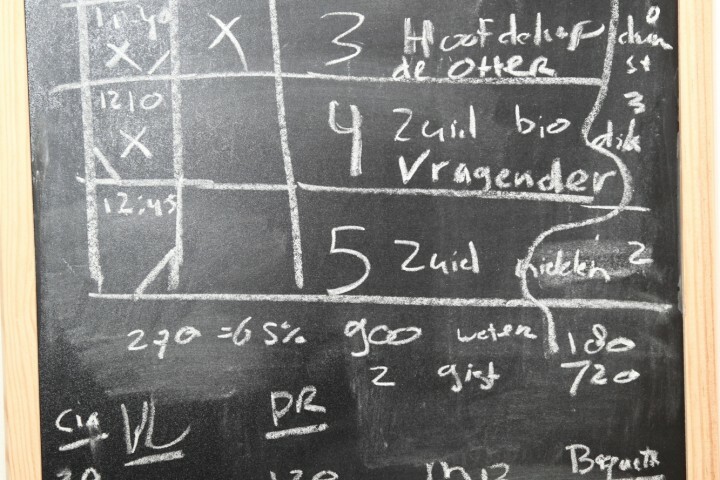 The organic flour milled by De Vier Winden was bought from De Zuidmolen in Groesbeek. 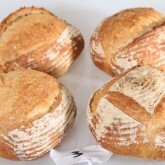 For this experiment we used a yeast version of our staple pain rustique recipe, like we did for flour experiment 1. So we dropped the sourdough in the preferment and used yeast instead of making a hybrid bread like we usually do with the pain rustique. 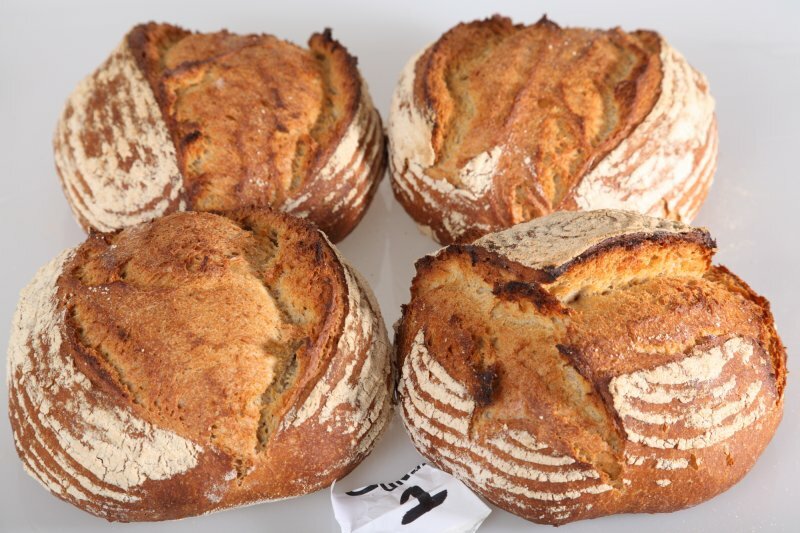 We use a small amount of whole wheat (around 10%) in the poolish of the pain rustique recipe, so in all five doughs we used the same organic whole wheat bought at De Zandhaas. Poolish made with the five different wheat flours. 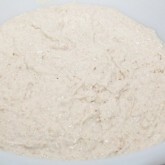 From left to right Flours 1 to 5. Right away you could see the difference in color between the five batches of poolish, ranging from very white to a medium grey. There was also a difference in water absorption, one poolish was much thicker than the other, while using the same amount of water. Ranging from thin to thick: De Otter, Nooit Gedagt, De Zuidmolen, De Vier Winden, De Zandhaas. 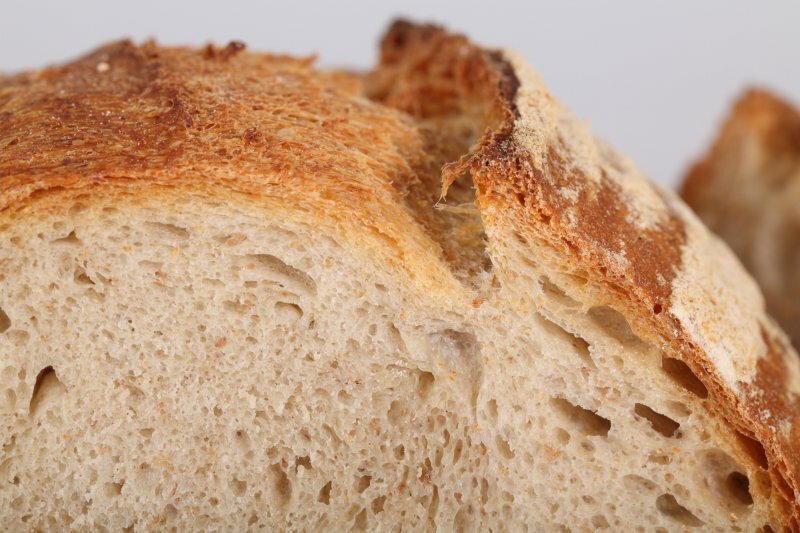 We used a hydration of 65% for the final dough so we knew for sure each loaf would be manageable and not too wet during the stretch and fold and shaping stages. The baking results. Again from left to right versions 1 to 5. A look at the different crumb structures and colors. Again in the same order from left to right versions 1 to 5. The second row of pics shows a close up of the different crumbs. 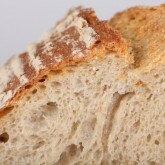 With all our observations we take bread made from ‘Molen De Zandhaas’ as our reference. All other factors, sweetness, appearance, complexity etc. 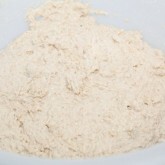 are relative to the breads made with this flour. 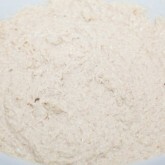 The flour of De Zandhaas is the one we use for almost all our bread baking and therefor know best. Molen De Zandhaas – Reddish medium thick crust, deep engaging smell, complex, flavorful taste with a sweet undertone and open irregular crumb structure. 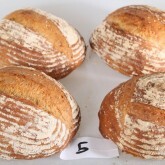 All four test breads had a nice oven spring and ‘ear’. 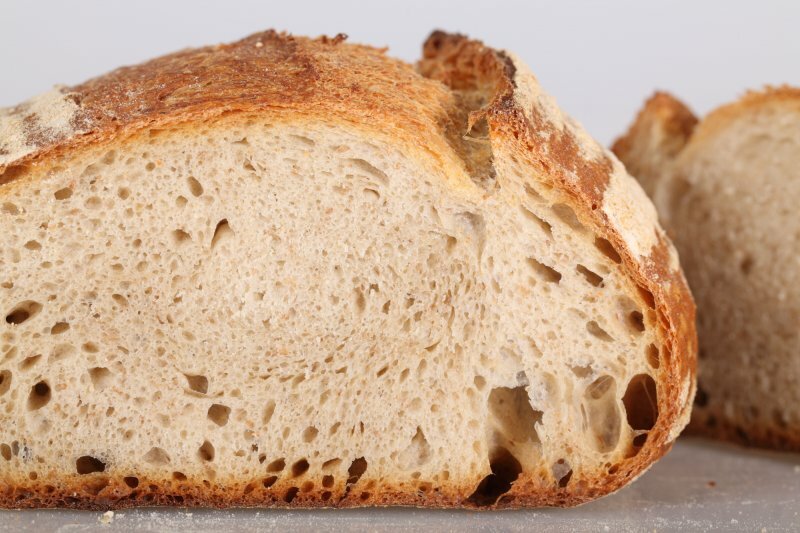 Molen Nooit Gedagt – Somehow the crumb structure was a little bit denser than expected, however the bread had a very deep taste with a subtle sweet tone. Two of the four breads showed no ‘ears’. 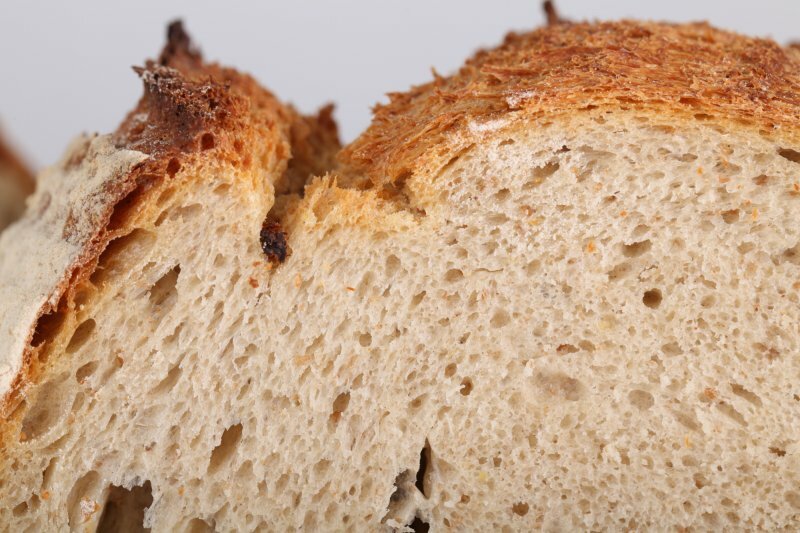 The color of the crumb had a more pronounced gray hue than that of the Zandhaas, (this is probably a bit difficult to see on the photos). 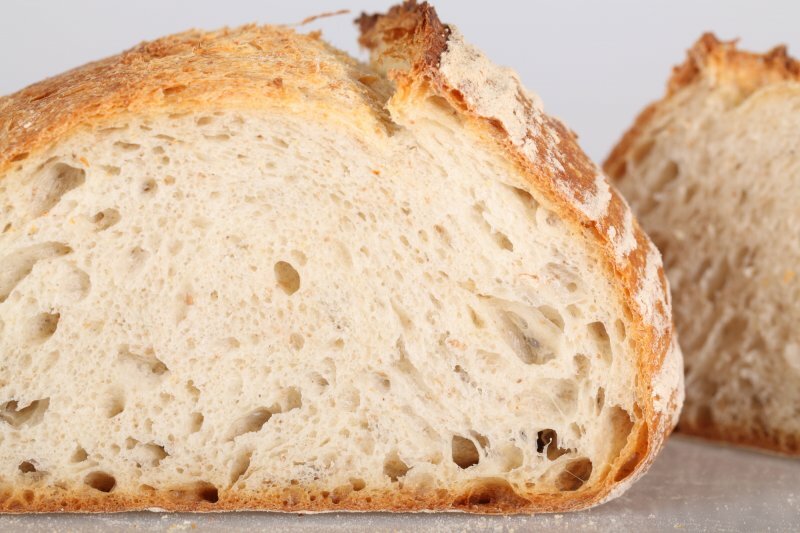 Molen De Windotter – The first thing you will notice is the white color of the crumb which was already visible in the color of the poolish. 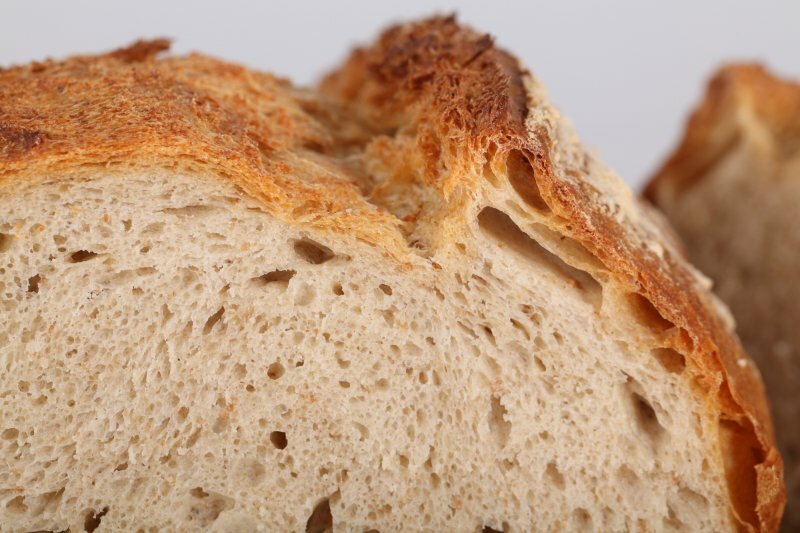 The bread has a fluffy and light crumb with a thin lighter colored crust. 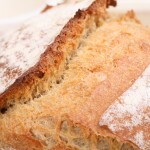 The bread had less taste and less noticeable smell although you could not call the taste ‘bland’. 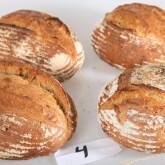 All four test breads had a nice oven spring and ‘ear’. 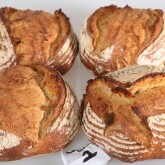 Molen De Vier Winden – These breads looked very much like the breads made with the Zandhaas flour. 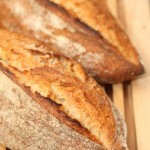 They were more or less equal in crust color, crumb structure and smell. However this bread had a small difference in taste (different but also very palatable), which is hard to describe again. Molen De Zuidmolen – Nice open crumb structure, a pleasant less complex smell, good taste however, not overly deep, more subtle. 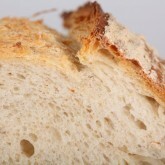 Less notable oven spring, only one of the four breads developed an ‘ear’. 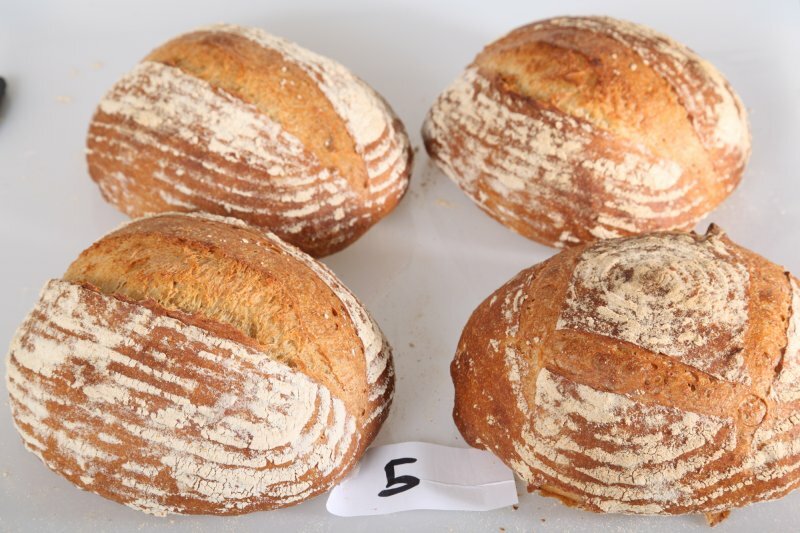 It was a little bit of a surprise to us that these five breads, made by the same people with the same recipe and only different flour would all end up as different as they did. Especially the different taste profiles. 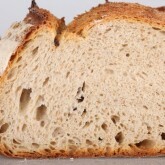 Every wheat, probably due to conditions, climate, variety, has its own characteristics that are still coming through in the baked bread (after careful handling by the miller we have to add, not after it has been roller milled and bleached et cetera in a factory and all the memory of what used to be a plant has been beaten out of it). The most important thing we want to say after this mill flour experiment is that we do not want to talk about it in terms of winners and losers. 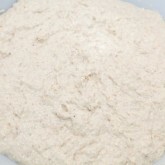 All the mill flours used yielded good quality and tasty breads. 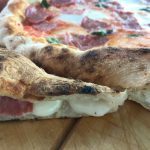 There were differences, as you can also judge for yourself from the pictures, but which flour you would choose, for the most part, probably comes down to personal preference. 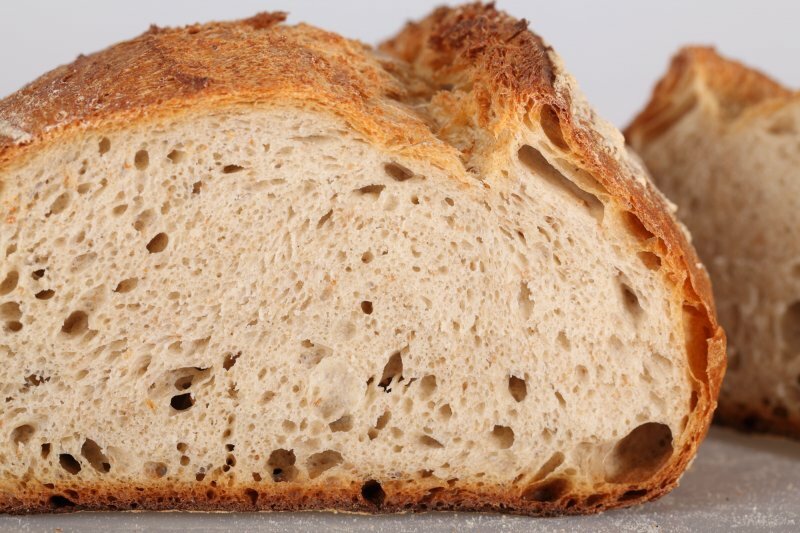 In contrast to the results of our cheap supermarket against organic mill flour experiment, which to us clearly showed the huge difference a good quality flour can make, both in appearance and (especially) taste. 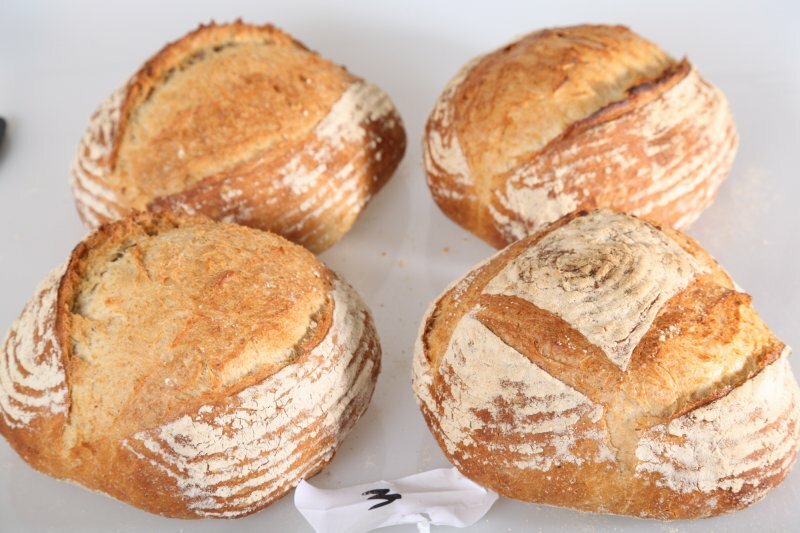 So in short, here’s our advice: Support your local mill and go get yourself a bag of good quality bread flour, it is worth it! 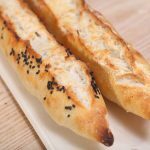 can you tell me which flour is used in traditional baguettes, the ones I love are a greyer colour in the middle, not really white like processed bread. 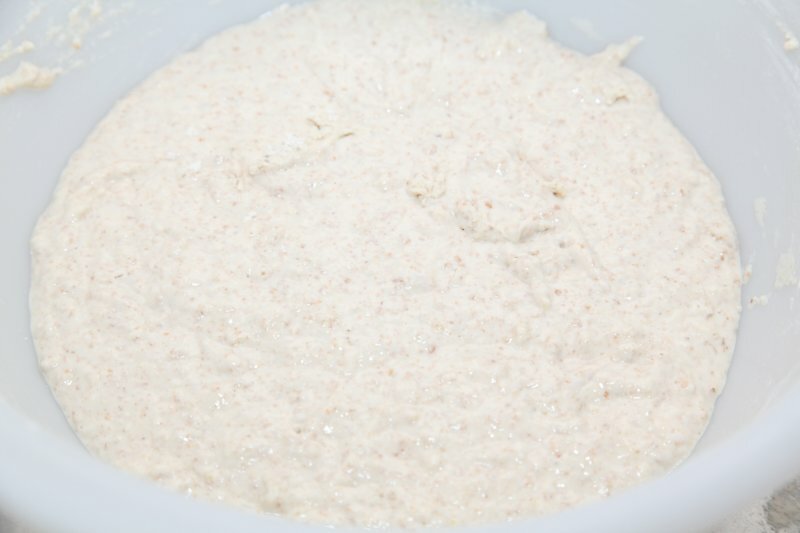 Hi, flour used in the real french baguettes is a bit yellowish of color. This is because of the carotene which resides in the flour. Happy baking! 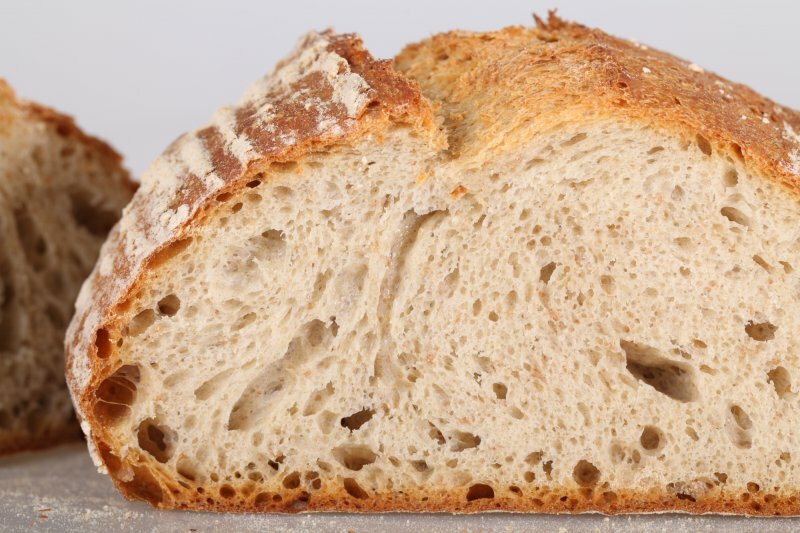 I must admit being surprised with the results… I use the flour from the De Windotter and do recognize the results you achieve as well… Tomorrow I will drive to Santpoort, to Molen De Zandhaas and get their flour as I would love to get the bread you bake from it. One question though: I noticed that De Zandhaas offers 2 different Tarwebloem versions; 68% Nederlands and 70% uitmaling… Which one do you use? 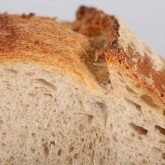 I believe it is the 68% eko tarwebloem (the wheat comes from Flevoland). When you are there and have questions about the flour you should ask the miller Jos Kors himself because he is the only one that really knows the details about the flour. 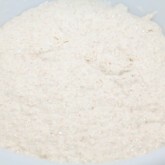 We do notice small differences with each batch of flour we buy, especially between summer and winter. 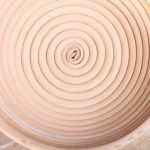 Sometimes the dough needs a bit more, sometimes a bit less water. But this way you know it is a product of nature. 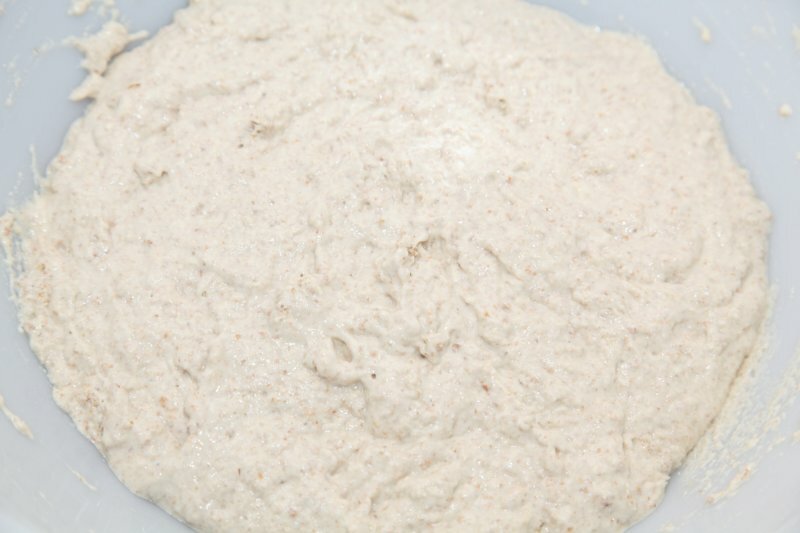 Let us know what you think after you’ve baked a bread with this flour, compared to De Windotter? We just visited the Zandhaas and left with lots of kilos….. What’s lovely and feel-good environment! Compliments to the staff who really know their products. We just arrived in a hotel a bit more up north and looking forward to the first bake next week! Will keep you posted on the results. Sounds wonderful! 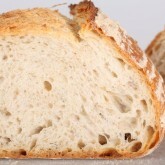 And please do let us know about your baking results with De Zandhaas flour. First findings…. 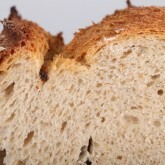 the color is so much deeper brown; crumb is off-white and looks a bit ‘creamy’ which I find very attractive! 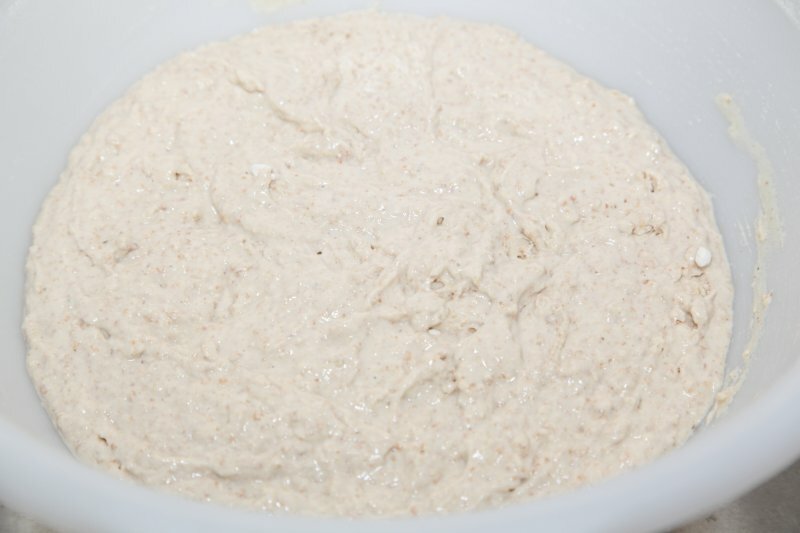 While building the dough the color is way more grayish as the flour I used before. Unfortunately I was not able to create a nice gringe on the bread but I do see that more often when baking a low-salt, yeast only bread which I did this evening. 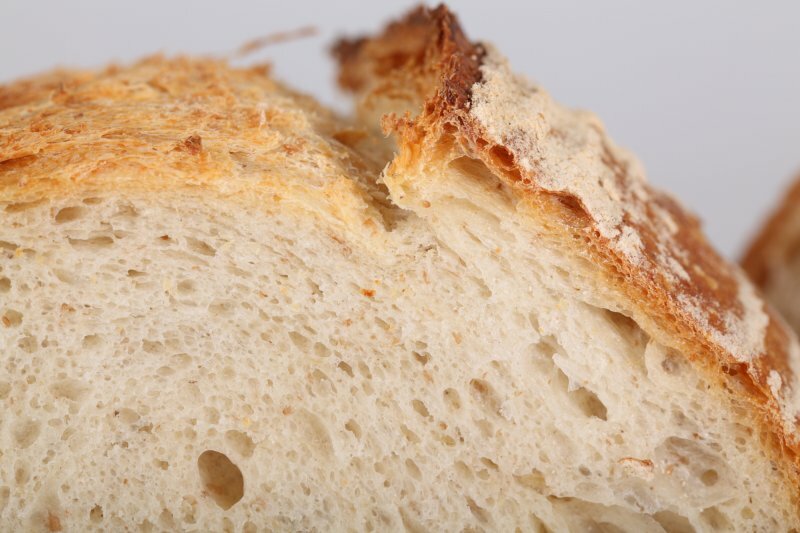 I’m building up a new sourdough culture so coming weekend new experiments…..
For now, I’m happy with the look of both crust and crumb and I expect to become a true Zandhaas addict in the future…. Thanks for the feedback Vincent! That sounds all very recognizable to us. Hope you’ll stay happy with the results like we do. We feel very lucky to have such a great mill so close to our home, but whenever we can we will be visiting other mills (still interesting to bake with and compare). Happy baking for now and many wonderful baking results and lots of joy and happiness for the New Year! This is very interesting to follow indeed. I agree with you on the crumb and texture side. 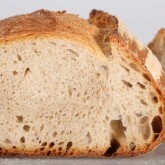 1 & 4 to me have the most desirable and pleasant crumb, crust, color & ear. 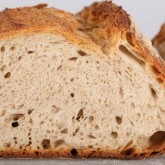 Also the color of the crumb is very nice. As for the taste, well unfortunately i wish i had the chance to taste and tell, but i trust your word for it. 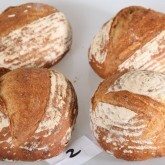 But examining the photos and reading about batch no 2 where two loaves produces no ear and the other two produces it. I don’t know, could this be due to the flour?! After all you are using the same flour for this batch from the same miller, so unless shaping was the reason for the no ear in two loaves, could it be possible that the flour was behind that?. 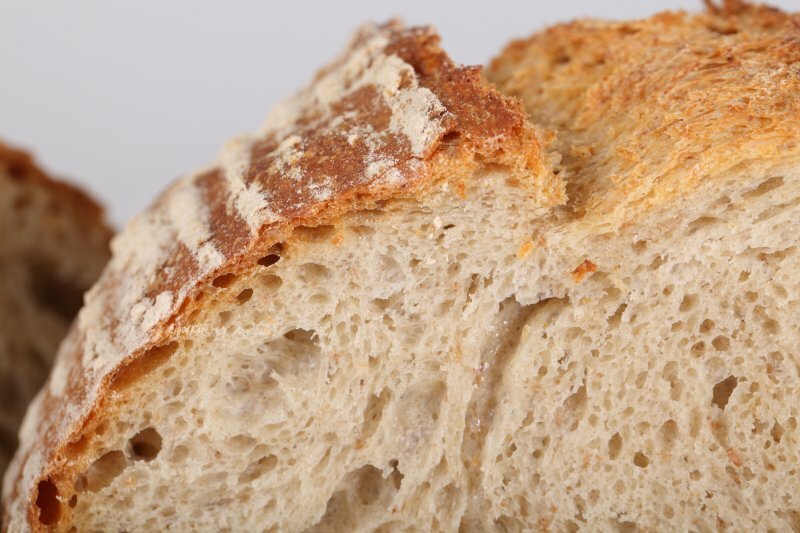 Another question, of course you are so enthusiastic about the flour from De Zandhaas for obvious reasons, but what are the characteristics of this miller’s flour that don’t exist in other miller’s flour, that makes it so good in producing such delectable breads? Looking at batch 2, I think it would be a bit too hasty to conclude it was the flour. There were two people shaping and of course that could also account for differences. 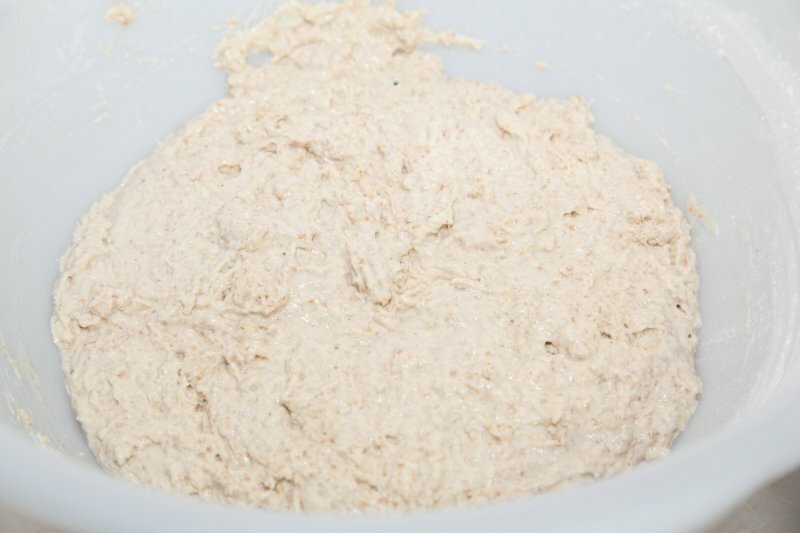 Your question about the characteristics of the flour are not so easily answered. The reason we went to De Zandhaas in the first place was that it was the closest mill to our home (then in Haarlem) and we got good results when baking. 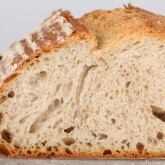 It was only later when we started to try other flour that we noticed, sometimes considerable, differences. We know a little bit about the growing conditions and where it comes from and the protein content. It must be a combination of these factors. We also did a blind taste test with four different people and they all chose De Zandhaas and after that nr. 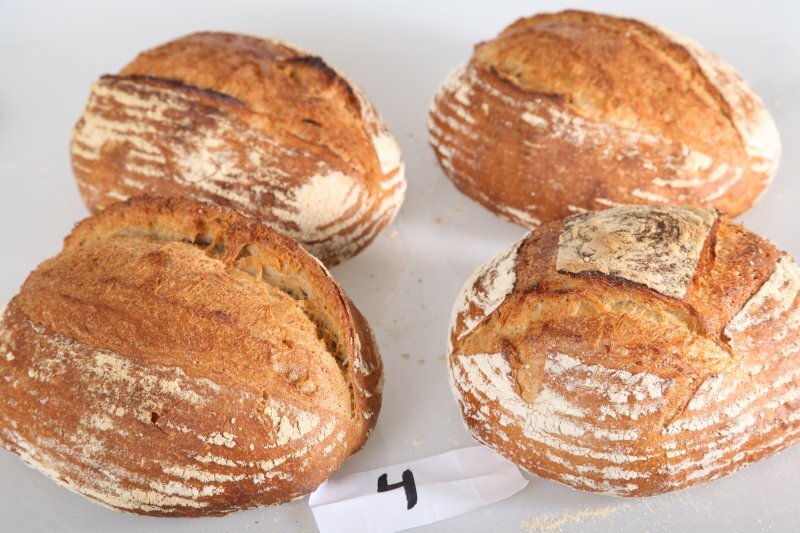 4 De Vier Winden, also an organic flour, as their favorites. But this can also be partly due to the fact that they were already familiar with the taste, because they ate this bread before. So a lot comes down to personal preference. For us, the eye opener was that there is so much difference to be discovered and that’s what makes bread baking even more interesting.